Like Original Sin, Magik is probably going to appear in a splattering of issues but then not appear in any of the other chapters or tie-ins. 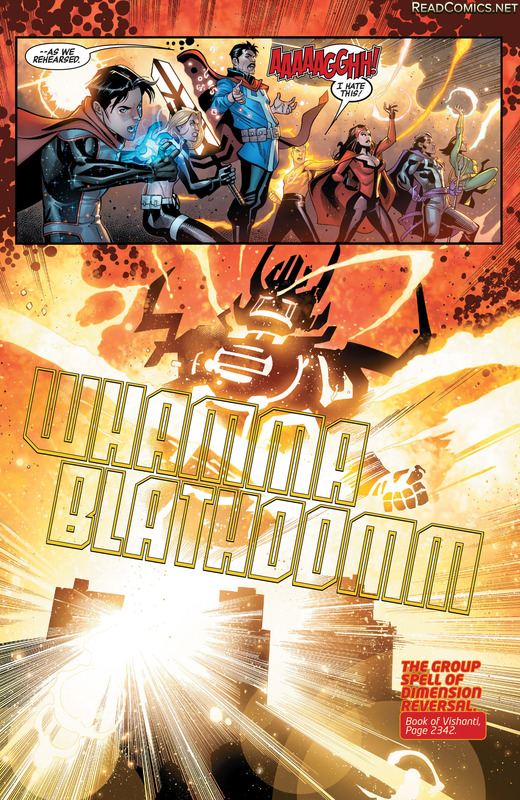 Issue opens with Maria Hill, in her typical mood of unhappy. She is joined by John Garrett, who is 90% robot and looks like he is rocking a Dum Dum Dugan style mustache. She suspects that Sunspot is going to be swayed by AIM and turn heel. 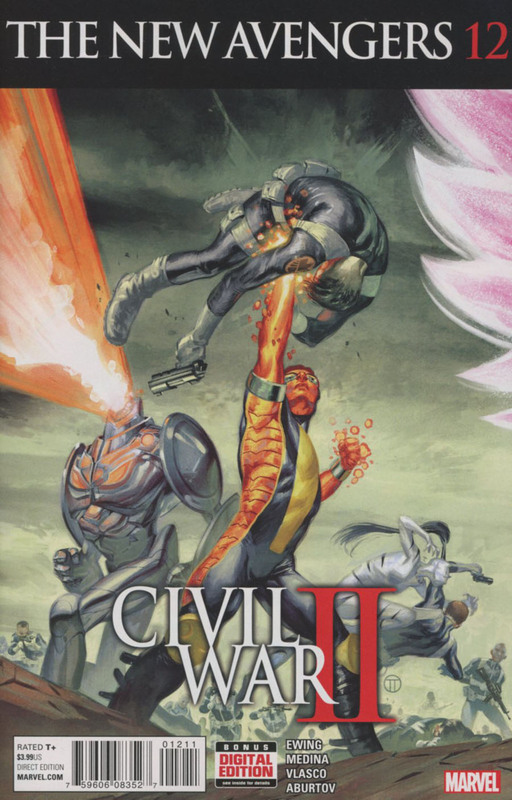 So that deals with the current storyline, now we get to the Civil War II tie-in. 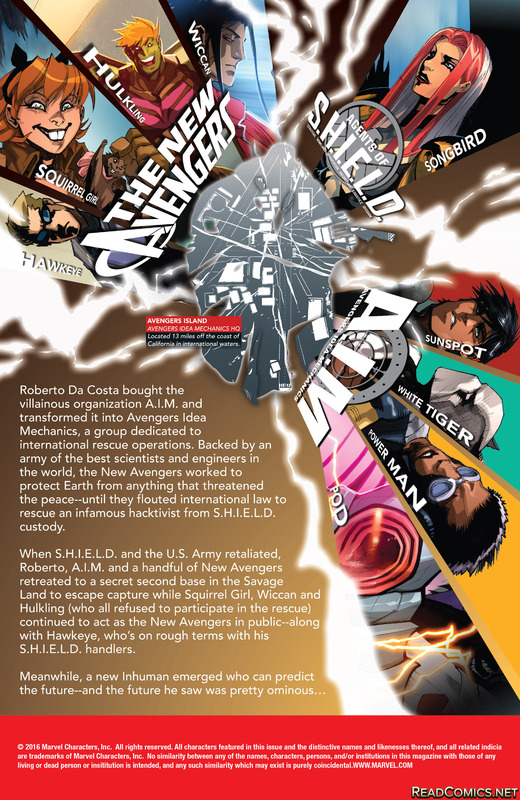 We get a fun narrative boxes, introducing the All-New New Avengers. They are represented in the all star cast of characters seen in Civil War II, when the heroes first confronted the Celestial Destructor. Hulkling reveals his soulsword that Wiccan gifted him with. Squirrel Girl has lots of questions, so this must be the first time it is seen. We cut over to Wiccan’s side of the conversation, as he’s part of Magik and her Sorcerers Supreme. 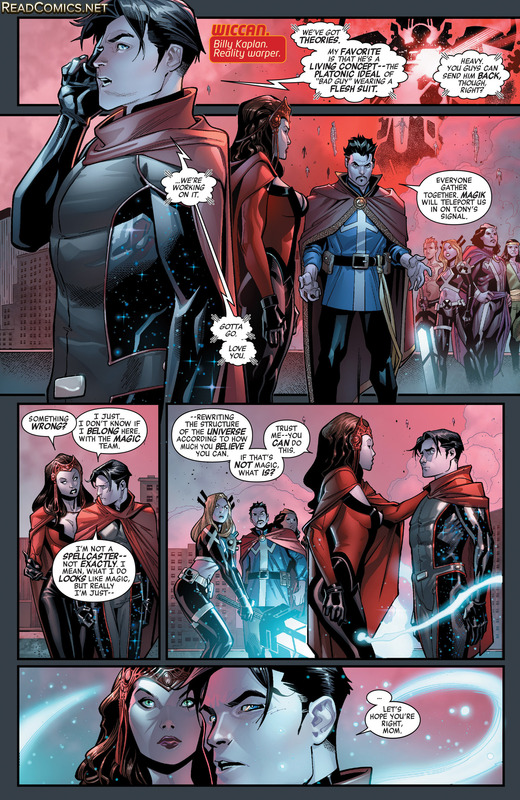 I like that Wiccan is still considered to be Scarlet Witch’s son. Doctor Strange acts like Magik’s only role is to teleport these chumps. Though without her, they can’t accomplish their goals so who really has all of the power? Poor Squirrel Girl is losing squirrels left and right! The Sorcerers Supreme cast the Group Spell of Dimension Reversal, from the book of Vishanti, page 2342. I like getting the minutes later scene as I’m sure the mages would be quite tired. Doctor Voodoo is quite tired, Magik is ready for round two – she knows no quit. Doctor Strange’s back hurts, as he is weak. Scarlet Witch wants some tea, make mine sweet, please. Wiccan can’t join his mother as his former boss, Sunspot, calls him. Cannonball is with Sunspot, Magik should be part of this team. Maybe Dani Moonstar too! What is she doing these days? I know Doug Ramsey is around too, pick that guy up too! That’s how I would do it. Does Cannonball still have his kid with Smasher? Or was that an alternate future? 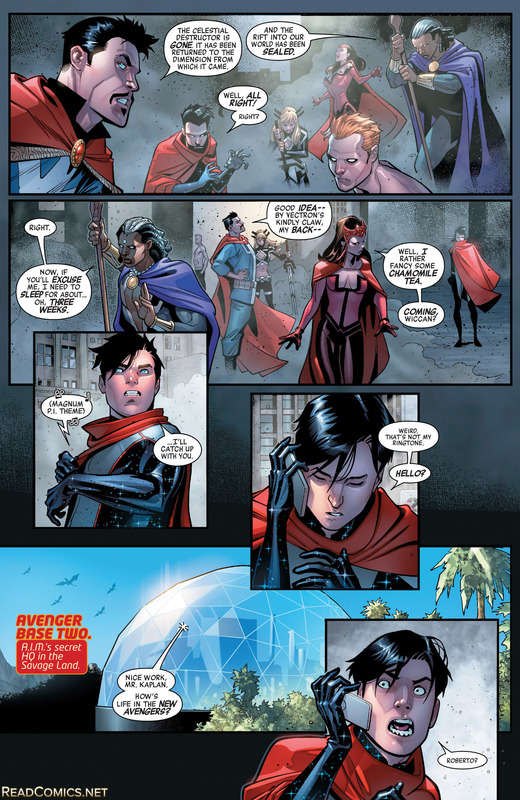 Hulkling and the New Avengers have rejoined Wiccan. Hulkling asks if Wiccan would be interested in Hulkling staying in his Centaur shape. Those two are the best. 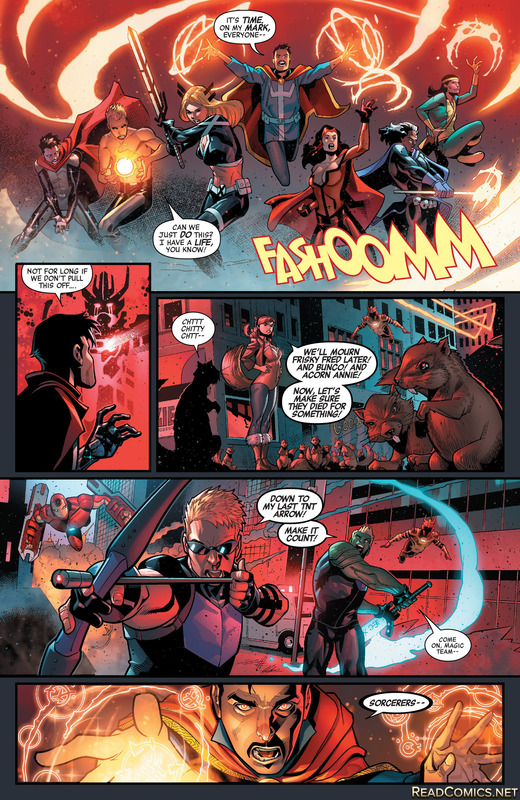 Sunspot wants his full team back but Wiccan doesn’t want to be an outlaw. Both Squirrel Girl and Hulkling are curious if Sunspot has a hovercraft made of robot eagles. A device that is too enticing to ignore. Sunspot finally has to admit that he doesn’t have that. Wiccan accepts to have everyone come in. We see that Sunspot is being watched by Ultimate Reed Richards (does he remember Secret Wars 2015?) he’s going by the name, The Maker. He’s running the organization, WHISPER, which we are not suppose to worry what it stands for – just like HAMMER. The Maker has created the New Revengers – Asti, Paibok, Skaar, OMNITRONICUS, Angar (who I know from Songbird’s origins), The White Tiger and Vermin – the awesome Captain America / Spider-Man villain penned by legend JM DeMatteis. Dum Dum Dugan, who is all machine, meets with Garrett. Dugan is overseeing the Howling Commandos. He’s also an alien LMD hybrid. Garrett takes over Dugan and also the thousand other Dugan LMDs that are in storage and turns them to his own means – which is finding AIM. I doubt I’ll get any other issues of this series, unless Magik is involved (of course) but this wasn’t a bad issue. I really have missed Paco Medina’s artwork.